Modular Panels are the ideal climbing solution for areas where a traditional climbing tower may not fit or where floor space is extremely limited. Modular panels allow for ultimate flexibility in design resulting in a climbing surface that exactly meets your space requirements. Possibilities range from low height traverse walls to soaring vertical walls. Our Auto-Belay Safety System is the perfect compliment to walls above 8′. Our system is a new and innovative approach to the modular wall panel concept. 4′ x 4′ fiberglass panels match up with neighboring panels and share topographical features such as ledges and bulges. A more authentic experience is then enjoyed by the climber. A standard block group of 4 panels share these common features. Gym mats are available to place under the wall to cushion the landing zone. They fold up against the wall when it is not in use for a clean, minimal footprint design. The Modular panel lends itself to many applications. 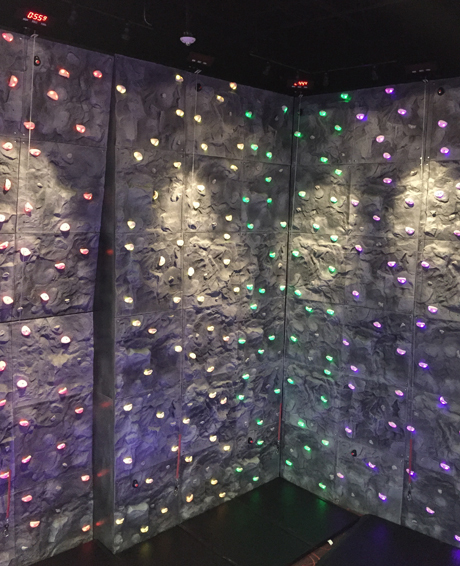 A low height traverse wall is perfect for schools, daycares, fitness gyms, play centers, and residential climbing walls. Taller, vertical walls are ideal for climbing gyms, family fun centers, and large fitness clubs.